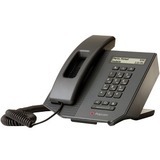 The Polycom® CX300 R2 is a USB phone that is optimized for use with Microsoft® Lync®. It seamlessly integrates with your PC's Lync client and combines the look, sound, and feel of a conventional, enterprise-grade telephone with plug-andplay ease of use. Experience Polycom's wideband audio voice quality for more natural conversations without echoes or feedback-whether in handset, full-duplex speakerphone, or headset mode-it's your choice.